We’re proud to continue to provide Support to OUR Industry. The Equine Chronicle relies on YOU the individuals in our sport to make things happen. 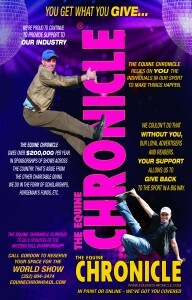 The Equine Chronicle gives over $200,000 per year in sponsorships of shows across the country. That’s aside from the other charitable giving we do in the form of scholarships, horseman’s funds, etc. We couldn’t do that without YOU, our loyal advertisers and readers. Your support allows us to give back to the sport in a big way. at the All American Quarter Horse Congress!